This series is not All Creatures Great & Small. The BBC series All Creatures Great & Small is one of those TV series I hold very close to my heart. If you want proof, please take a look at here, here or here. This is a series that I have been watching since a very young age. I have read the books of James Herriot and seen every episode of All Creatures Great & Small. Of course, I was very leery about anything that is made about him that takes him out of the surroundings of Darrowby. It’s a series with James but without the likes of Siegfried or Tristan Farnon. There is no partnership with his life-long love Helen. 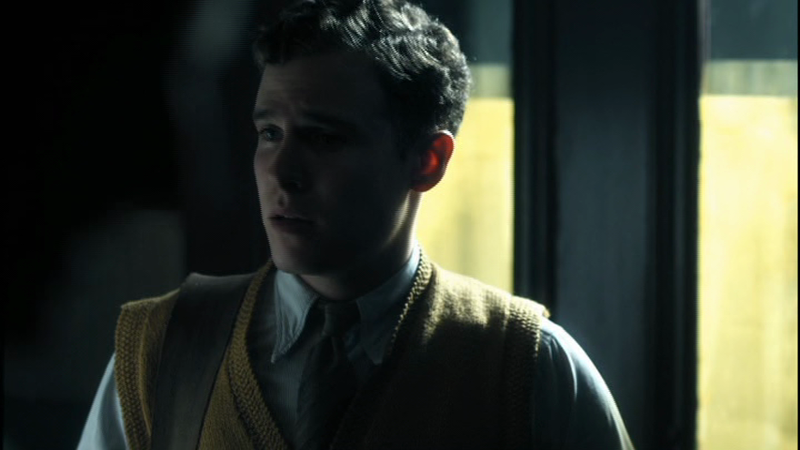 Young James Herriot takes place before all of this. As someone who has grown up watching this series, it may be easy to see why I was so concerned. Like I said in my first sentence, this is not All Creatures Great & Small but that is because it is not supposed to be. It is a series that creates its own feel and we watch James as he enters veterinary college in Glasgow. This is a really good series and one that I should not compare to All Creatures Great & Small but I may unintentionally slip a little. There is a lot of work that goes into this series and it pretty much succeeds on every level. To me, what was the most important aspect was James himself. There was something about James in All Creatures Great & Small that I loved. He was optimistic and had the ability to laugh at himself and take misfortunes in stride. I appreciated his optimistic side. That is what I wanted to see and I think I did. Young James Herriot was a series that ran over three nights from 12/18/11-12/20/11 on BBC One. It’s about the years of James Herriot we have never known about before which was his years in veterinary school. The series starts off with James (Iain De Caestecker) arriving in Glasgow to begin his training as a vet. Right away a man by the name of Rob McAloon (Ben-Lloyd-Hughes) plays a joke on James that makes him late for his first lecture. Just as I mentioned at the beginning, James takes this in stride. Of course he is upset but by no means is he vindictive about it. From the start, James runs into problems. He doesn’t have a ton of money and ends up losing his room he was going to rent because he was scammed. Plus, through all of this, he caught the attention of the professors at the school and not in a good way. His first day there, James breaks up a fight between Professor Richie (Tony Curran) and a workman by the name of Halliday. This is over how Halliday is treating his own horse. Halliday throws a punch at Professor Richie and James breaks it up explaining that he can look at the horse since he is a vet. Of course that is not true. His says this not knowing that Richie is a Professor at the college James is attending. James has only been in school for a couple of hours! 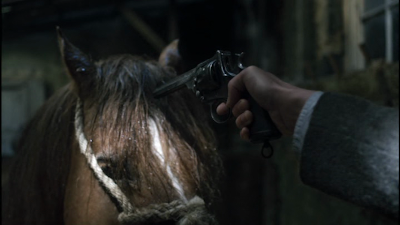 Professor Richie explains to James that if he thinks he knows so much already, he should figure out what is wrong with Halliday’s horse. The one problem I had with James going into school is that it is said that he did no scientific studies at all in school. I am taking that he didn’t do any chemistry or anything sort of science classes at all. I am not sure how he was accepted since it appears his professors are somewhat confused by this too. One thing that is made clear in the episodes and backed up by the “Making Of” feature on the disc is that James entered into veterinary school when the field appeared to be drying up. Because automobiles were becoming more mainstream, horses were starting to be phased out of daily work life on the streets and in farms. To stay open, these schools needed to do whatever they could to keep money coming in and I suppose that is how James ended up in school. Professor Richie says that being a vet also takes instinct and James really does show that in these episodes. When it comes to instinct, James feverishly researches to find out ways to cure Halliday’s horse. Even after he misdiagnoses the animal on a couple of occasions and basically making an enemy out of Halliday, James perseveres to find a way to cure the animal. Is James able to do it? The ending of this episode is similar in some ways to the ending of the first episode of All Creatures Great & Small, Horse Sense. What make this series great are the characters that James meets. Even though McAloon is a sarcastic jerk and is that way throughout the series, they do become friends. James also meets from the beginning Emma “Whirly” Tyson (Amy Manson). Her and McAloon are close friends and they live in the house of her Auntie Munro (Natasha Little). Whirly is part of the new wave of thinking not only hitting the veterinary world but just the world in general. She is part of the movement that believes that women should be equal to men. She is one of the first women in veterinary school and campaigns for equal rights for even something as simple as a women’s bathroom. It is an uphill battle for her. For her views in the world at that time are extraordinary and are often not shared even by other women. For her to be involved in the veterinary world is unimaginable in 1933. This view especially not shared by Professor Gunnell who is also Vice-Dean of the college. He does not believe women have an equal right in the world and they do not have a place in the veterinary field. Gunnell and Whirly clash often with Whirly nearly being kicked out of school on a couple of occasions. Auntie Munro owns the house that Whirly and McAloon live in and the James eventually joins. Auntie Munro is a widower and has an appetite for younger men. 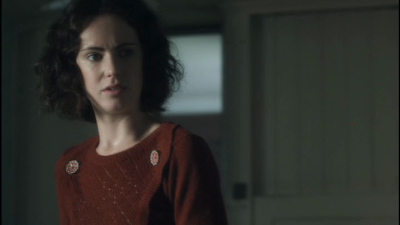 She takes an immediate shine towards the young Herriot. It’s done affectionately and in a tasteful way. Auntie Munro is constantly flirting with James and to some extent McAloon but she is a wonderfully loveable character. The series itself is kind of gloomy. This series does not take place in the country of Darrowby or the confines of Skeldale House like All Creatures Great & Small. This is Glasgow which was a booming big city in the 1930s. The color palette is dreary. The rooms are smoke-filled with a green and white color scheme to them. To be honest, the whole color-grading of the series is pretty drab. In the second episode, the series does get out to the country and even out there it isn’t quite as colorful as one would think though it is nice to see a young James Herriot out on a farm trying to make things better but that isn’t what happens. James Herriot means well but he is a massive trouble-maker. In each of the episodes he causes huge amounts of trouble while trying to do good things. Over the course of these episodes through his meddling, James manages to cause misfortune to the Halliday family virtually eliminating the means for them to make money which forces Halliday to put his son into a poor house, James breaks up an engagement between a man and a women that also causes the women to be estranged from her family and finally he nearly gets Whirly kicked out of school for unknowingly ratting her out for a prank she played on Professor Gunnell. The episode features some pretty big themes that really brings some great dramatic moments to the series. I already mentioned the theme of equality of women that Whirly strives for throughout the series. It is done in a way that absolutely does not over power the narrative and feels right for how the story is told. I think what is more interesting is that other women during this period do not share her view. Jenny Muirhead is also a student at the veterinary college. The difference between Jenny and Whirly is that Jenny believes that if she just puts her head down and not cause a fuss, she will get ahead in her career. Also Jenny’s parents are rich. When I mean rich, think of rich and times that by ten. They basically own Glasgow. Professor Gunnell actually gets money from her parents to start a scholarship program. Jenny and James start to see more of each other romantically. The problem with Jenny’s parents is that they are fascists in 1930s Europe. They invite a bunch of notable people to their home, of course when I say home I mean castle, to raise money to fund Mussolini. There is even an ongoing analogy between the fascist movement and the pure bred dogs that the Muirheads keep and how they refuse to have those blood lines altered even if it means the death of one of their most beloved dogs. It’s not all drama. In the second episode of the series, which is my favorite episode, the veterinary class is sent out to handle some real life experience in the field as the vet in the area is ill and has asked for the school to help him out. Classmates need to team up and unfortunately for James he is labored with McAloon. All the other students have some really interesting cases but James and McAloon get assigned to looking at a lamb that had been hit by a bike. The lamb is a cherished family member to this husband and wife. McAloon decide he wants to make money off this couple and comes back for multiple visits and charges them. Finally, there is nothing more he can do and has to put the lamb down but did he? My favorite moment occurs at the end of the second episode and won me over as a fan of this series. Check it out; I don’t want to ruin it for you. Overall the series is directed very well. There is a scene with James doing a ton of research on horses when an idea hits him. Just at the moment, one of the old-fashioned light fixtures in the room turns on over his head as he has his “eureka” moment. 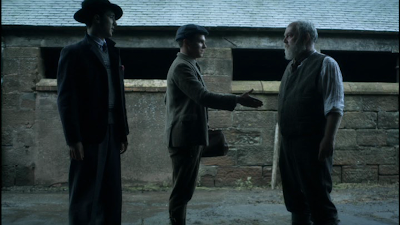 Though I did see some continuity errors in some shots such as it raining horribly outside a barn but when James goes into the barn, the rain is still coming in but the light coming in is sunshine which was not evident outside. There are other shots when someone is looking at another person in a shot but when cut to s different shot, they are no longer looking in that direction. Minor things like that. What is here is the essence of James Herriot. James Herriot in this series IS the same James Herriot in the TV series All Creatures Great & Small. He IS the same character as he is in the books written by Alf Wight. He is not a womanizer, he is a kind and gentle person who has a passion to do whatever it takes to save animals. He is still good tempered and generous. 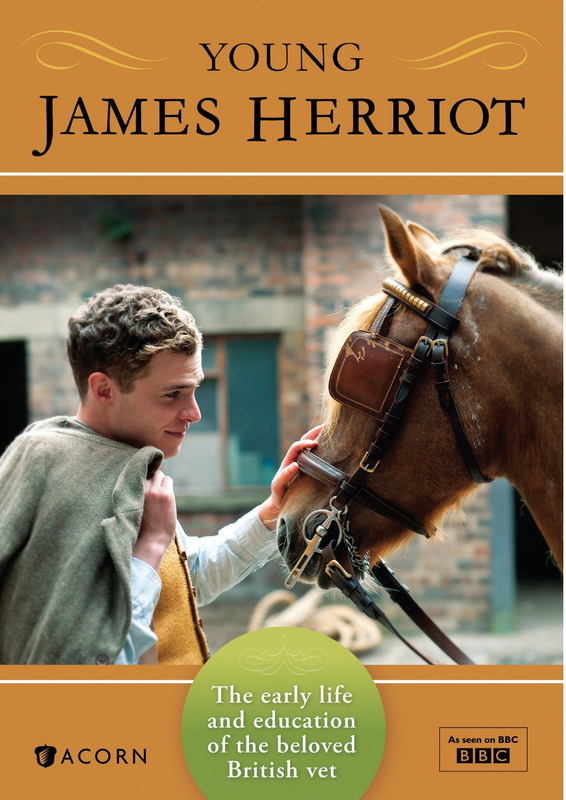 Here he is very naïve but it is still James Herriot and that is why I accept this series. The people who have made Young James Herriot have done right by him and that was very, very important for me as someone who adored the stories and characters of this cherished vet. With a series made in 2011, it would have been nice to see a Blu Ray release. Once again, as I am sure is the case with Injustice, there probably isn’t a market for it. Too bad, I think with the attention to detail this series has in the sets and some of the locations; it would have been gorgeous even with its paler color palette. The one thing I was not very happy with is the compression of the episodes on this release. As being a standard definition DVD release, I know that this is hard but the compression was not great. There are scenes with fog and/or smoke and there are some weird artifact effects happening. To be honest, it bothered me. I am a quality snob and I was disappointed by it. Luckily it is not constant and the episode themselves more than made up for this. I think anyone watching this on a non-HD TV will not have a problem with this. The main extra on this release was a 21 minute feature (which didn’t help the compression) on the Making of Young James Herriot. I like this a lot. It was incredible to see all the work that was done by getting the period feel right for it. The main street featured in the episodes were made specifically for Young James Herriot. It was also nice to see the son of Alf Wight (James Herriot’s real name) Jim talk about this series and how not only he approved of it but thinks his father would too. Alf died in 1995. The Making of Young James Herriot seemed to have some production problems. For example, shots of the people being interviewed were weird. They were either too close up or there was a strange amount of head room in some of the shots which made it look a little unprofessional which I am sure it is not. Also the sound was not mixed very well on it. Especially every time Joanna Vanderham was interviewed, her sound was really, really low. What I did like about the feature was that it was a straight forward “Making of” feature and not something that was overly spun like an Electronic Press Kit. I hate stuff that is overly produced with ton of graphics and interviews from the actor who are over the top and almost nauseating. 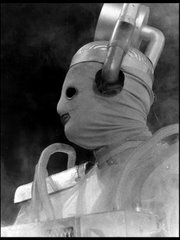 If I want that, I will watch any of the special features on the new series of Doctor Who. The “Making of” on this disc is straight forward and tells a story of the love for the character of James Herriot which is what I have too. One other extra on the DVD is a photo gallery with a lot of great behind the scenes shots from the production. It features the theme music played over it…..constantly. Incidentally, I thought the theme music sounded something like what I would hear for a Michael Palin travel series. The DVD comes in a single DVD amary case. The cover for this is very attractive and once again I think it is more designed and pleasing than the UK version. It is strange because the UK release of this DVD is also from Acorn Media yet why they are different, I do not know. I do see that the UK release is a two disc set which might help with the compression of the episodes. 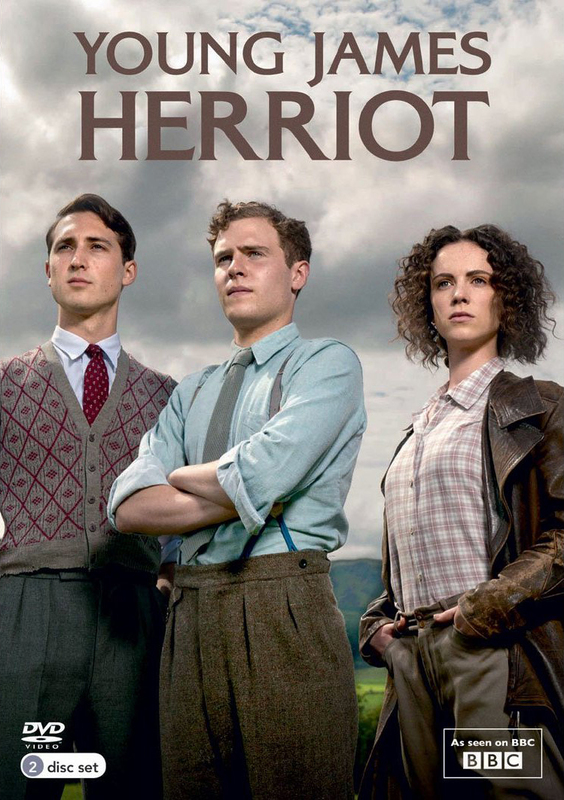 I know of a couple of people who are not sure what to think of this series as they, like me, are life-long fans of the work of James Herriot. Like them, I wasn’t so sure what to expect. What I got wasn’t All Creatures Great & Small and that’s because it is not meant to be that. In fact, in the “Making of”, the producer explicitly states that they were not trying to re-create or compete with it. You know what? It still fits in with that series because the character of James Herriot is still there. It doesn’t matter what setting he is put in, if the character is still loyal to the one that Alf Wight created then he could appear in anything. The series ends in a way that a second series could follow. I am one of those fans who would be very happy to see more adventures with McAloon, Whirly, Auntie Munro and of course the young James Herriot. Next week: My hope is before next week to fit in a review of the 20th Anniversary specials of Absolutely Fabulous from BBC video. What I do know is that next week I will post my tribute to actor Geoffrey Hughes who appeared in many productions but is my personal favourite as Onslow in Keeping Up Appearances. While I knew Young James Herriot would never be All Creatures Great and Small, my hope was that it would not sully the memory of one of my favorite shows. You have given me a reason to watch this - I will just have to take it on its own merits and see what happens. Once again, thank you for a good writeup! I hope I do not lead you astray on this. Thank you for the kind words about the review. Once I wrote the article I checked some other places to see what other people thought and I saw it was panned. I just don't agree with that. It is clear a lot of work had gone into this production and the characters are likable. When you check it out, please let me know what you think.